Long before the poinsettia became a traditional symbol of the Christmas season in Mexico, the Aztecs cultivated the red and green plant, which they called cuetlaxochitl, meaning: "mortal flower that perishes and withers like all that is pure," in their native Nahuatl. Poinsettias were a favorite of both kings Moctezuma and Netzahualcoyotl for many reasons - not the least of which, was because the red flowers represented blood sacrifices so favored by the Aztecs. On a practical note, the flowers were used to make valuable red dye and were thought to have medicinal powers such as stimulating circulation, healing skin infections and curing high fevers. In the 17th century, Franciscan priests living near Taxco noticed that the scarlet flowers bloomed during Christmas time and resembled the star of Bethlehem. They began using them to decorate churches and altars during the Fiesta de Santo Pesebre, or celebration of the Holy Manger. According to legend, people flocked to church, long ago on Christmas Eve with bundles of flowers to fill the Christ child's manger. A little boy named José was very upset because he was too poor to buy any flowers. According to the story, an angel appeared to him and told him to pick some weeds from a nearby field. 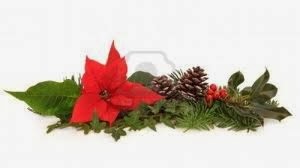 José did as instructed, but when he put the weeds in the manger, they were transformed into beautiful scarlet flowers, which Mexicans to this day, call Flor de la Noche Buena (Flower of Christmas Eve), or simply Nochebuenas. When Joel Robert Poinsett, the first ambassador to Mexico (between 1825 - 1829) saw the fiery flower he was so taken with it that he sent several to his home state of South Carolina so that they could be raised in his greenhouse. 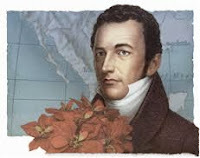 Initially dubbed the "Mexican Fire Plant," the plant was later officially named the "poinsettia" in honor of its "discoverer." 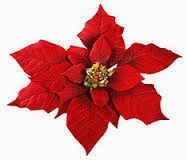 By the early 20th century, the poinsettia was already popular throughout the US and was being sold as potted plants. The rest, as they say.....is history. Poinsettias are always nice to have around at Christmas, but it's good to know the legend attached to them. I agree! I've always loved learning about new legends. Interesting to read the history. I remember seeing them growing wild in Nepal - and blooming in late November. It's one plant I adore before Christmas and can't get rid of soon enough by the time January rolls around. So true. They make everything so festive, but once Christmas has passed, I'm over them, too. I love poinsettias at Christmas. We spent last Christmas in a rental home and didn't have the decorations I usually put up. I bought a few cheap things, but adding a poinsetta plant or two made all the different in a festive feel. Thanks for the interesting history. I couldn't agree more. They make everything so festive. Thanks for the history lesson. I definitely learned something. As the last of the leaves fall off the trees here in Philadelphia, I am happy that the Christmas season poinsettias are starting to show up. We can certainly use the color. I agree! They really make the season so festive. I've always loved this legend. We were surprised to see a very poinsettia-like bush in bloom here on Fiji, and I am wondering if it is a relative. 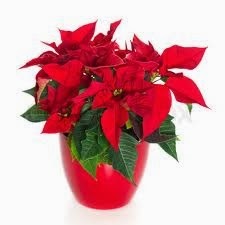 The legend of Jose is such and charming story and I loved learning about the poinsettia and it's history. Thanks for sharing! My pleasure. I happen to really love legends. What a beautiful story, one that I'll recall each time I see pointsettias~! 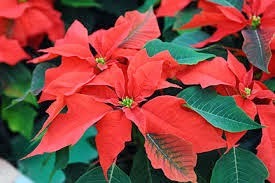 I enjoyed the background story on poinsettias, though I did already know they originated in Mexico. FYI, I once saw a gigantic poinsettia plant on Hawaii's Big Island. Wow! I would never have expected to see them in Hawaii! They do symbolize Christmas in the U.S. so we are always amazed to see them growing as garden flowers in Mexico.